Moshi Monsters most popular monster is Katsuma and now your Moshi Monster fans can play a game all about Katsuma on Nintendo DS or 3DS. I briefly mentioned Katsuma Unleashed in my gaming blog when I was talking about the Activision Family Game Summit. Once my child tester has a chance to play the game she will help me with a post on that blog. Moshi Monsters: Katsuma Unleashed is a side scrolling game that allows the player to control Katsuma and jump, spin, dash and bash their way through six brand new worlds. Win battles, defeat bad guys and find secrets. Last year our Holiday Gift Guide featured Moshi Monsters: Moshlings Zoo. That game went over well with my daughters, especially my gamer daughter, so I know she will love this one. 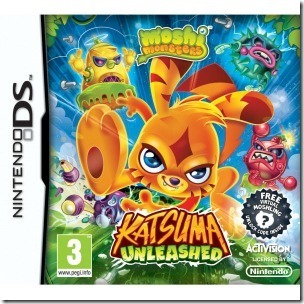 One lucky reader will win Moshi Monsters: Katsuma Unleashed on DS/3DS.